Well it’s official, my husband and I do not have green thumbs. We planted a wonderful garden this summer consisting of tomatoes and zucchini. We bought cages for the tomato plants to ensure they would have the proper support to grow nice and tall. We even took extra precaution, making sure there wouldn’t be any nutrient stealing, spacing the plants just right. In short we gave our garden the plush comforts it would need to produce bountiful produce. We had hoped to have plentiful tomatoes and zucchini. In our daydreams we had so much that we had to give them away to friends and family. But reality was far from that. Unfortunately a mysterious animal, we think a deer, had a feast each night while we slept. Due to our garden massacre I instead found myself at the farmers market stocking up on local produce. I always find myself making traditional zucchini bread, but EVERYONE has tried zucchini bread. That’s when I discovered zucchini brownies on Pinterest! 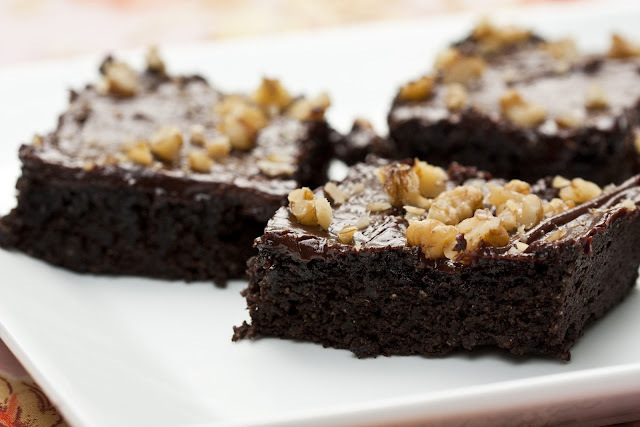 WOW, who knew you could make chocolately goodness out of zucchini?! There were quite a few recipes, but one in particular by Yummy Life stood out. 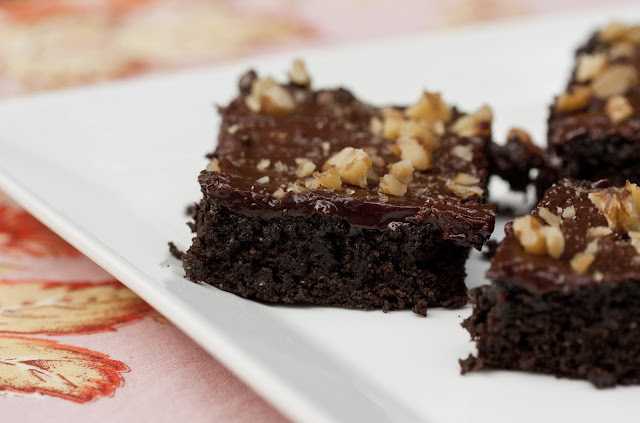 Dark Chocolate Zucchini Brownies! Not to mention they’re egg free which intrigued me. AND they include greek yogurt which I love. I love chocolate. And I love dark chocolate even more. If you don’t care for dark chocolate, don’t worry as you can still make these. Simply substitute regular cocoa powder for dark cocoa. And before you begin, you’ll want to make sure you have your food processor handy. Unlike many recipes that call for shredded zucchini, this one calls for pureed zucchini. For that reason alone I was excited to try it, as my parents bought me an amazing Cuisinart food processor for my birthday that I wanted experiment with. The brownies came out great. They were extremely moist and very chocolately. I couldn’t taste the zucchini, but I think it’s the key ingredient to ensure these brownies are exactly the opposite of dry. Plus, if you have kids that aren’t fond of veggies, it’s a great way to sneak in some nutrients without them knowing. These do have a different taste compared to traditional brownies. I don’t quite know how to describe it, except to say that I liked it. Enjoy! In a food processor puree: zucchini, coconut oil, yogurt, sugar, and vanilla. Set aside. In a large bowl combine: flour, cocoa powder, baking powder, & salt. Use a whisk to mix. Add wet ingredients and stir until well combined and evenly mixed. Lightly butter the bottom and sides of a 9x13 pan. Pour brownie batter into the pan and bake for 20-25 minutes. When brownies are done, an inserted toothpick will come out clean or with a few moist crumbs. Cool for 25 minutes before frosting. While brownies cool, make the frosting by combining chocolate chips, evaporated milk, butter, and vanilla in a small saucepan. Heat on the stovetop over low-medium heat. Stir constantly as chocolate begins to melt (approximately 5 to 8 minutes). After chips have melted and mixture is smooth add the powdered sugar. Whisk until smooth. 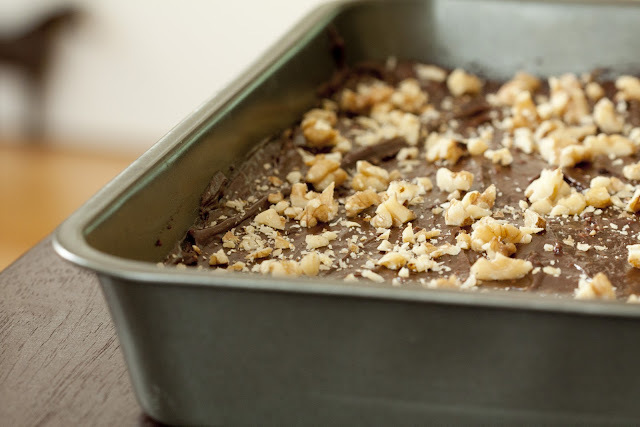 Spread frosting evenly over brownies and top with chopped nuts. This past weekend my husband and I were invited to stay with friends at their cabin on Higgins Lake. We jumped at the chance and shipped our baby girl (black lab – Bella) off to Grandma’s house for her own mini vacation while we escaped to a relaxing getaway. Of course my mind immediately started to wander, daydreaming about what type of goodies we could bring. With the temperature expected to be a bit cooler, and a hint of Fall in the air, I thought cookies would be the perfect weekend companion. But what type of cookie? 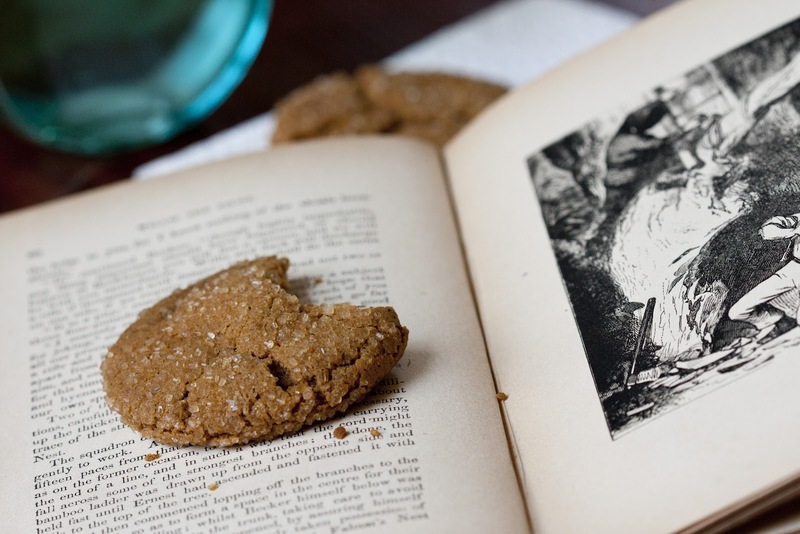 Whenever I bake cookies, I’m always looking for new recipes. I typically search my favorite food sites and sort through those that have the best reviews. The below recipe happens to be one of those. 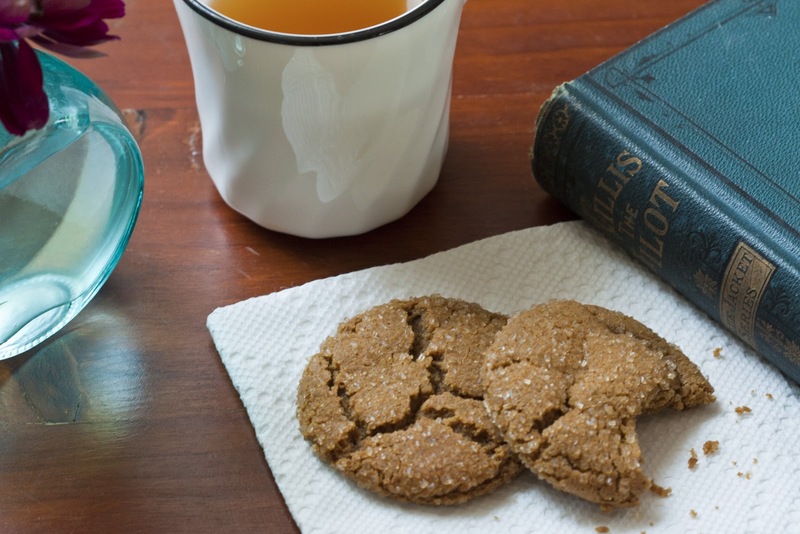 I must admit I’ve never sought out a molasses cookie recipe, since I’m more of a chocolate and peanut butter girl, but when I saw all of the spices I knew I had to try these! If you’re not familiar with molasses, it’s very sweet (made from processing sugar cane) and is extremely dark. Imagine an almost black pancake syrup. I know, not the prettiest picture, but don’t let this stop you from making these. While in the oven, the molasses works its magic, transforming these into soft, chewy cookies with an irresistible amount of spice. 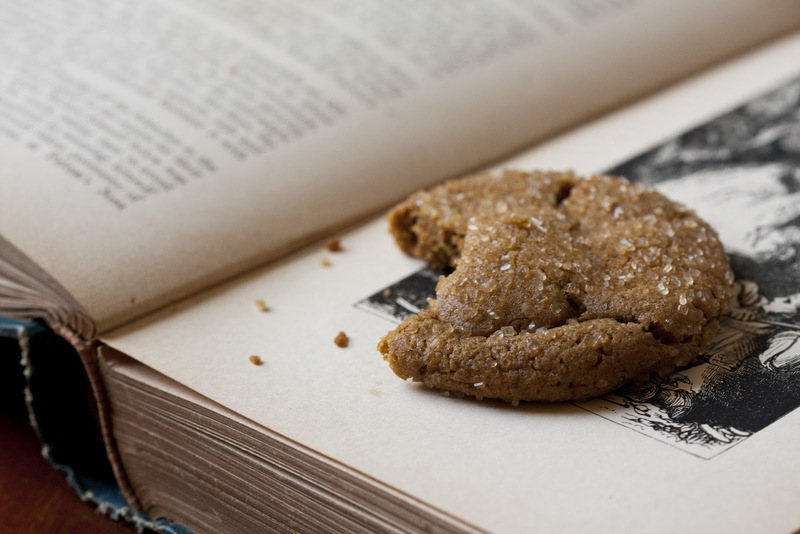 If you like gingerbread cookies, you will LOVE these. I’m already planning to serve these over the holidays as they’d be perfect for a Christmas party or cookie exchange. Enjoy! Total Time: 1 hour 40 mins. In a large bowl cream the shortening and brown sugar. Add the egg and molasses. Mix well. In a medium bowl combine all dry ingredients (except Sugar in the Raw); stir to combine well. Slowly add dry mixture into the large bowl with egg and sugar mixture. Mix well. Cover and chill dough in the refrigerator for 1 hour. Remove dough and roll into medium sized balls (slightly smaller than a golf ball). Sprinkle a plate with Sugar in the Raw, and roll dough balls through the sugar, evenly coating the outside of each ball. Bake for 8-10 minutes. Let cookies remain on cookie sheet for a few minutes before removing with a spatula. I used to never eat salad. Probably because I didn’t like vegetables. But over the last few years I’ve come to love vegetables and at times even crave them. It’s funny how tastes change. When I began eating salad, I slowly eased my way in by selecting only those that were made of iceberg lettuce. Now I’m a little bit of a salad snob and prefer those that have dark, luscious greens like romaine or spinach. Not only do they taste good, but they’re more nutritious for you as well. And toppings?! Oh how I love salads with unique toppings. One of my favorite salads that we eat regularly throughout the week is Spinach Salad with Salmon & Dried Cherries. Besides dried cherries some of my favorite toppings are avocadoes, roasted sweet potatoes, toasted pine nuts, and the list goes on. Hence the recipe for this unique dish! It all began at work when my manager offered my co-workers and I some of her salad. 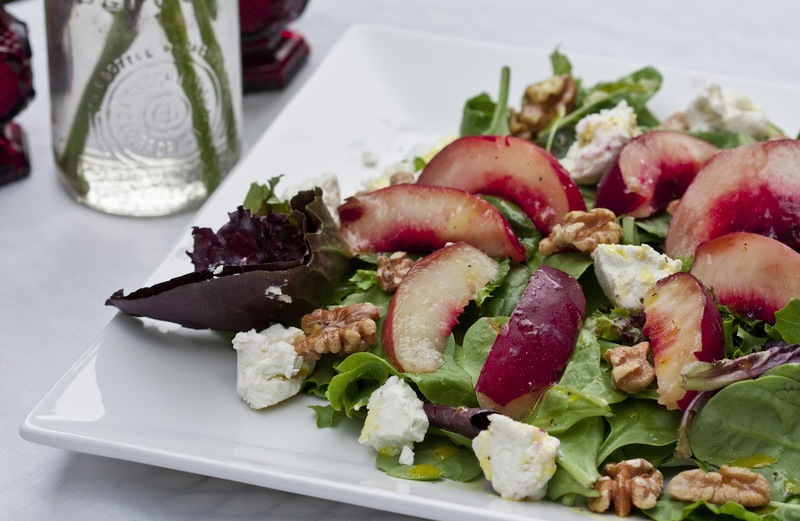 It looked very intriguing with nectarines scattered on top, whole walnut pieces, and goat cheese (chevre). When I took my first bite, WOW, what a combination! 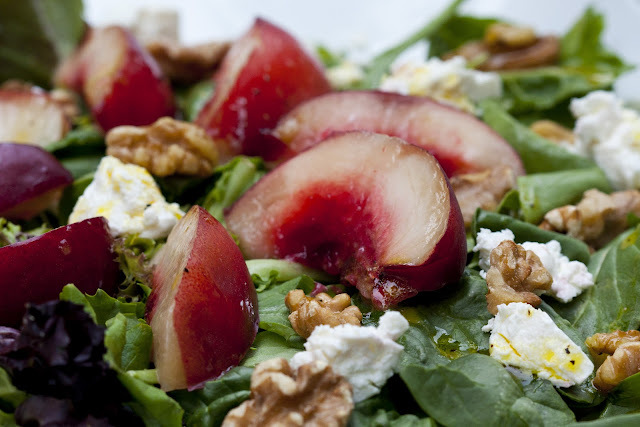 The sweetness of the nectarines, followed by the crunch of the walnuts, and creamy goat cheese was out of this world. I was hooked and knew I had to re-create this at home. I hope you enjoy it as much as I do. 4 cups spring mix or your favorite greens such as arugula, spinach, etc. Assemble dressing in a small bowl by combining: vinegar, honey, mustard, salt and pepper. While whisking, slowly add in the olive oil. Cover and refrigerate. Toast walnuts by placing on a baking sheet and bake for 8-10 minutes. Remove when walnuts have a hint of brown and become fragrant. Place spring mix in a large bowl or on a large plate. Cut the nectarine into 6 to 8 slices. Place on top of the spring mix. Evenly distribute the toasted walnuts over the salad. Break apart the goat cheese into mini bite size pieces. This can be done by using a spoon to scoop small dollops, or use a knife to cut mini pieces. Distribute evenly on top of the salad. Drizzle with desired amount of dressing and serve. In the summer there always seems to be an abundance of tomatoes at our house. We have a small garden with a few kinds, but we also try different varieties from our farmers market. I love having fresh tomatoes readily on hand to garnish sandwiches and burgers or to simply eat cherry tomatoes as a quick snack. Since we have a stock supply of tomatoes, I have a basil plant that I keep on my back porch for easy picking. Fresh basil has a wonderful flavor and pairs extremely well with tomatoes. Taking all this into account, you can say I’ve gotten pretty creative with tomato recipes. My favorite snack or appetizer has to be Tomato, Basil & MozzarellaPoppers. But this week I discovered a new dish from a recipe I found on Pinterest. This is a cold, refreshing side dish that you can serve with just about any meal. And the best part is it’s extremely easy to put together. The key ingredients are grape tomatoes, garbanzo beans (chickpeas), and basil. 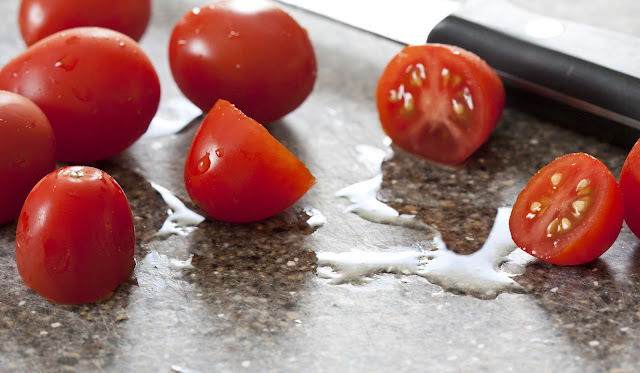 Keep in mind that you can always cut whole tomatoes into bite size pieces if you don’t have grape tomatoes accessible. 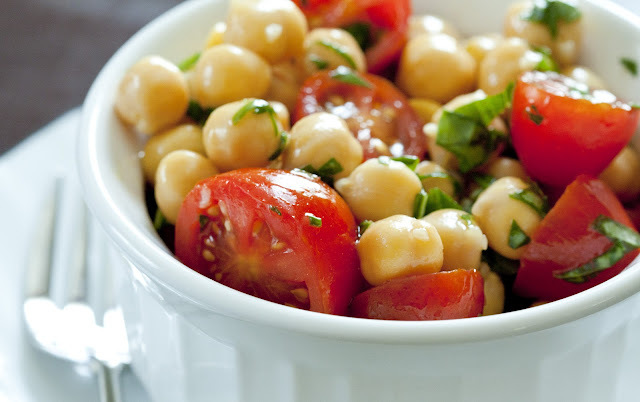 If you’re not familiar with chickpeas, they have a mild nutty flavor and are rich in minerals. They’re quite popular in vegetarian dishes as they’re an excellent source of protein. 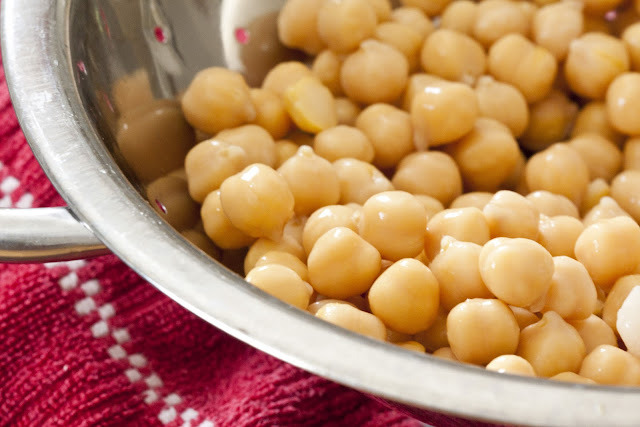 Just one cup of chickpeas contains 29% of your recommended protein intake. If that doesn’t entice you, just know that this salad is healthy and will leave you feeling invigorated. Give it a try during these hot summer months. After all, it’ll only take you 10 minutes to assemble. Drain chickpeas and rinse in a strainer to remove the starch. Place in a large bowl. Chop the basil and cut the tomatoes in half. Add to the bowl and combine with the chickpeas. Add remaining ingredients to the bowl. Stir to combine well. Refrigerate for 30 minutes before serving. Serve cold.